Nigeria’s consumer market has captured global attention. A significant proportion of this emerging market opportunity is in the FMCG category. Due to historical reasons, 87% of this retail trade happens in the “unorganized” or “informal sector”. The market is highly fragmented and inefficient. Yet due to the nature of the informal economy, most of this economic activity has been overlooked or not captured by conventional market analysis and research. CPG companies wishing to enter this market need a map of the landscape in order to navigate the opportunity successfully or to design the most appropriate and relevant business model for their needs. Nigeria’s informal retail trade can be segmented into three major categories – Tier 1 (approx 5%), Tier 2 (approx 30~35%) and Tier 3 (approx 60~65%) of which Tier 1 is the most formalized with some amount of business processes in place. The real challenge in addressing the market commercially is the unorganized nature of the bulk of the trade – Tier 3 – who tend to be market women buying and selling goods in open air markets and street corners without any business infrastructure. There is no feedback loop in place for manufacturers and distributors who have little idea on how to plan and estimate their product pipeline. Yet, the methods and tools available in the formal economy with its information, communication and financial services infrastructure cannot be directly implemented either due to the informal, flexible, unstructured nature of the sector. There is a gap in knowledge and in understanding of the business practices in the cash based informal economy. In order to bridge this gap, we need to begin by understanding the informal retail business from the ground up. Then we need to figure out how to use smartphone technology to map retail locations and keep a finger on the pulse of consumer demand and product sales flow. Market survey of FMCG retail distribution space – trends in etail, ecommerce, business models, distribution models, startups and apps. Insights on demand creation, market development, consumer behaviour – loyalty, relationships, purchasing patterns, choice of location. 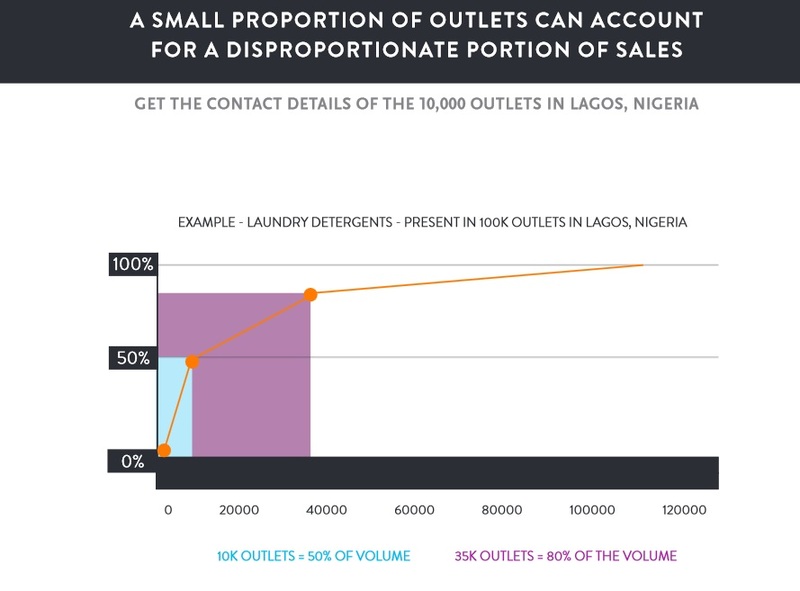 The basis of the optimal solution for maximizing distribution of consumer products across the vast, undocumented and fragmented informal retail sector, such as in Nigeria, would be using Pareto’s Law to cluster and identify the retail outlets to be reached for a particular product category’s target audience and thus, crafting the most cost efficient reach strategy. 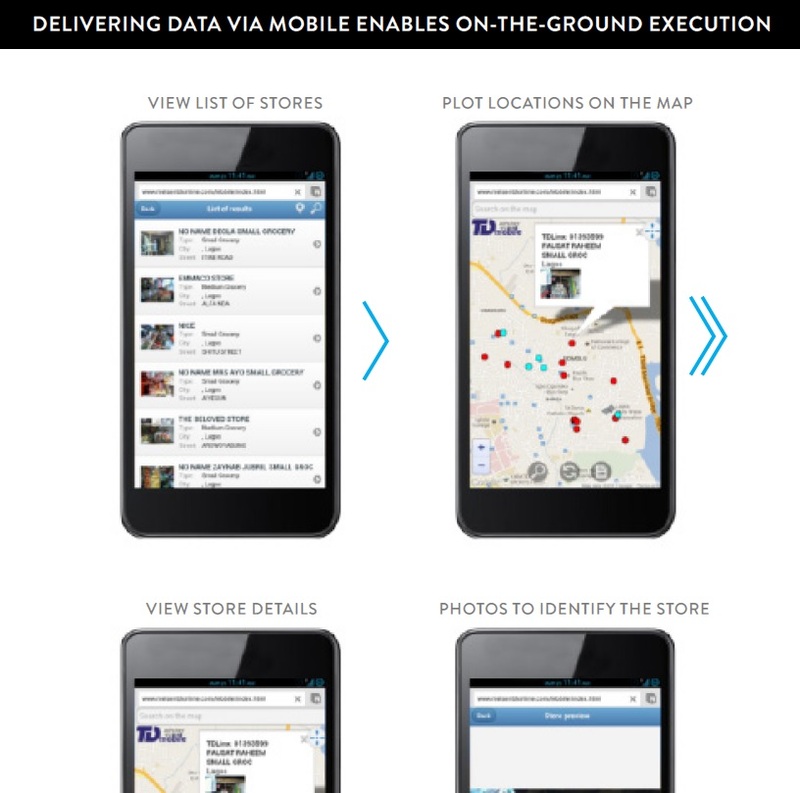 ITC in India has already implemented the use of GPS in a tablet based inventory management solution which sales officers use in the remotest areas to send real time data on inventory, demand and sales back to the company headquarters using ubiquitous mobile connectivity in the remotest rural area. 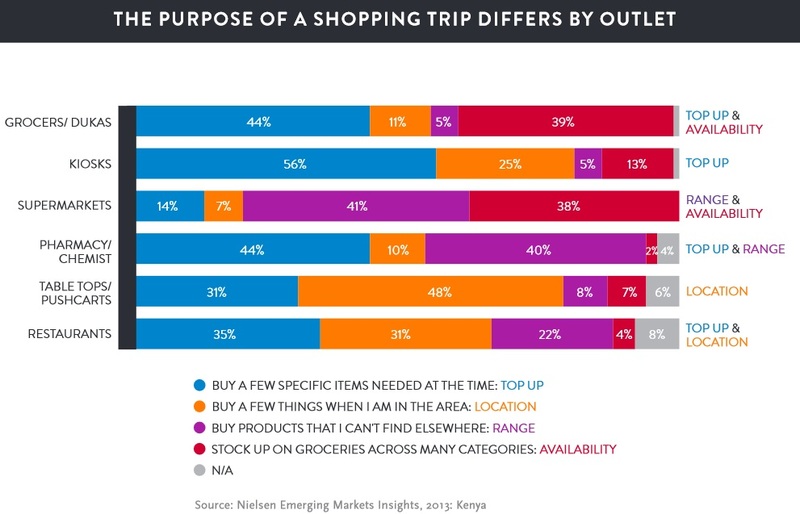 With the right list of outlets and channel clusters, manufacturers are better able to offer the right product format and size to meet the particular needs of the consumers who visit those particular outlets. Crucial details such as store location, type of store, trading days, opening hours, access to power and water, the presence of a storeroom, categories stocked, and a long, long list of other characteristics should be captured during the survey. Simply knowing which stores have refrigeration can transform the business of a Guinness distributor in Nigeria, for example. Clustering retail outlets by volume of sales as one of the attributes. While reasons for visiting different retail formats were documented what’s missing is the frequency of visits. Also required is a chart capturing purchasing patterns seen most commonly among the majority (the prepaid or kadogo economy) who manage on irregular incomes in informal markets where over 90% of all transactions are conducted in cash money. Those need to be mapped against buyer behaviour for a true picture of the rhythms of the bazaar, without which the CPG firms will not have a finger on the pulse of the market, just reams of numbers without a contextual framework and foundation. One element, for instance, would be seasonality, the “high season” and “low” which are commonly seen in cash dependent markets. Also, flexibility in this context does not simply mean variety in packaging and SKU sizes or branding the product container. Flexibility refers to the flow of cash – the time and money – that allows for the management of volatility between outgoing expenses and incoming cash flow. In the retailer’s context, this would be the interplay of credit and cash, inventory and demand and of course, “fast moving goods”. Lets see how this research initiative proceeds to understand and grapple with that critical characteristic of the operating environment and retail ecosystem that distinguish the African consumer market. Download the Neilsen Africa Retail Labyrinth report as a PDF. Contact me if you’re curious to know more about the original thinking behind the situation analysis and research plan. Business and Design in Stasis?